The growth of online reading may be changing our brains. What does that mean for reading instruction? I have a good friend who gives everyone in her life the same holiday gift: a book. She feels a book represents the most thoughtful kind of gift because it is a deeply personal gift and something they can hold onto or share if they so choose. Last year, I asked her what she does when the recipient is a dedicated Kindle reader. Without missing a beat, she said, “I still get them a real book. Kindles are not for real reading.” My friend’s attitude reveals just how much the digital age has transformed reading and literacy in our society. These changes are not just about how we choose to read (device vs. book) but also the way our brain reacts to those seemingly endless choices. Back in the day, our reading choices were mostly limited to books, magazines, and newspapers. Now, we can read about almost anything in a variety of formats and on a range of digital devices. But even if we could manage to wrestle their digital devices away from them, students are constantly being reminded that they need to be ready for 21st-century careers, many of which focus on technology. Is it realistic to expect students to engage in deeper, more thoughtful reading when the skills that go along with skim reading — the ability to cover lots of information across many sources, find key words, and identify major themes — are highly prized in a society and economy obsessed with data and information? We hear again and again that employers covet these skills and lament the fact that more graduates don’t have them. The conflicting demands between the need to read deeply and the need to quickly sift information clearly represent a challenge for educators. The Common Core State Standards tried to reflect these 21st-century learning needs at scale, and those who led the effort have the scars to prove it. The English language arts standards laid out new reading and literacy expectations for students that upended traditional strategies and instruction. In some places the pushback was fierce, with educators and parents fearing that the standards’ emphasis on reading for information and text dissection would kill the joys of traditional — or deep — reading. But others applauded the standards’ realistic take on the literacy skills students need to compete and succeed in a digital world. The debate has simmered down as more states and districts have made the standards their own, even if that means simply changing the name of the standards to anything other than the Common Core. Yet despite all the research and policy chatter about how new standards and digital technologies can improve reading and literacy rates, U.S. students are simply not progressing. Using the most recent reading scores from the National Assessment of Educational Progress (NAEP) as evidence, a 2018 article in The Atlantic by education writer Natalie Wexler explored why U.S. students have remained in a holding pattern when it comes to reading skills. The answer, according to a panel of national experts, lies with how students are taught to read and which aspects of reading are being emphasized in elementary school. Students find themselves caught between mastering skills for a test and engaging in the deep reading of rich content in a way that will build their knowledge and vocabulary. The experts said that teachers have wrongly treated comprehension, an essential component of literacy, as a discrete set of skills. They pointed to No Child Left Behind’s narrow but intense focus on reading and the law’s rigid testing requirements as part of the problem. The law’s good intentions — to ensure all students were on grade level for reading — proved to have a deleterious effect on young readers, especially those already at risk. In an argument familiar to those who’ve read E.D. Hirsch’s work, Wexler explains that this is because reading comprehension often depends on the reader having content knowledge and vocabulary about the subject they are studying. For example, if a child knows nothing about World War II, how can they comprehend a passage about the Dunkirk evacuation? U.S. teachers spend large amounts of time teaching students how to master such comprehension skills as finding the main idea and making inferences, but precious little time teaching content. Once again, students find themselves caught between mastering skills for a test and engaging in the deep reading of rich content in a way that will build their knowledge and vocabulary. Maryanne Wolf refers to the current period we are in as the “hinge moment between print and digital cultures” and warns us that there are hidden costs associated with this shift. Educators will no doubt continue to grapple with that shift for some time, but I take comfort in the fact that they are not struggling in isolation. As a society, we are all trying to manage the digital age. And while there are still plenty of unknowns about the impact on reading and literacy, we can at least identify two important takeaways for educators: First, reading comprehension goes hand in hand with content knowledge. Testing students only on their comprehension skills without attention to content knowledge and vocabulary will not increase student literacy. Second, digital technologies are like any other innovation in that they offer both benefits and challenges. Education leaders must take seriously the job of helping both teachers and students make the most of this brave new world. From a policy perspective, since the Every Student Succeeds Act (ESSA) eased some of the rigid testing requirements of NCLB, state and local leaders have some flexibility regarding how they approach literacy instruction. The plethora of reading programs and interventions available to state and local leaders is impressive, but it is a “buyer beware” marketplace. ESSA’s four tiers of evidence are meant to give states and districts parameters within which they can choose a research-informed intervention, but there is not a lot of guidance and support for education leaders trying to make tough choices. So the jury is still out on whether ESSA will help improve U.S. students’ performance on NAEP and other reading assessments. For educators and the rest of us, there are a lot of unanswered questions about what’s on the other side of this hinge moment. Baron, N.S. (2017). Reading in a digital age. Phi Delta Kappan, 99 (2), 15-20. Wexler, N. (2018, April 13). Why American students haven’t gotten better at reading in 20 years. The Atlantic. Wolf, M. (2018, August 25). Skim reading is the new normal: The effect on society is profound. The Guardian. Citation: Ferguson, M. (2018). 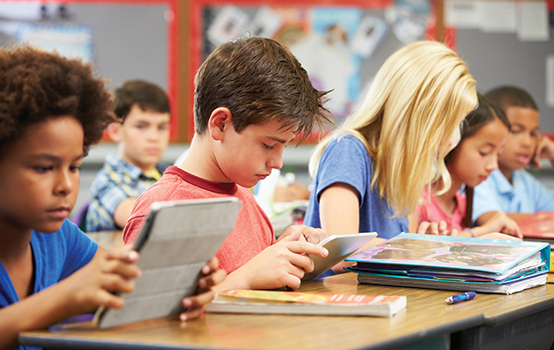 WASHINGTON VIEW: Preparing students’ reading brains for the digital age. Phi Delta Kappan, 100 (4), 64-65.